Receive with simplicity everything that happens to you. Thus begins the new Coen brothers movie. The most mature movie the groundbreaking duet have ever made. For me, it is obvious they're going through a dark phase: after the so-so Intolerable Cruelty and Ladykillers, they're really dived into darkness, with each new film more misanthropic than the earliest. 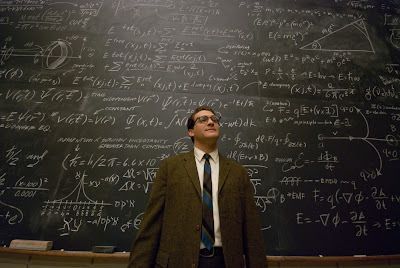 A Serious Man is also the most personal movie the brothers have ever made, taking place in 1967 among a suburban Midwestern Jewish community, reminiscent of their childhoods. The titular character is a somewhat respectable physics professor whose life begins to crumble, much like Job himself. He is of course surrounded by idiots (it's a Coen movie after all) and he slowly takes that downward turn into stupidity. The film - much like A Man Who wasn't There - is of course not for everyone, but it's practically perfect. The camera placement is expertly calculated (courtesy of DP demigod Roger Deakins), the music is haunting (by permanent collaborator Carter Burwell) and every single performance is pitch perfect. - We can't know everything. - It sounds like you don't know anything. So how come you give it 9/10. Cinematography might be excellent, but if the movie fails to say anything of value, or entertain, or move you emotionally what is the point? Also the movie is incredibly entartaining, but also (like the Coen bros do), it plays with the audience's expectations.